A new study reveals that the volcanic eruption of Mt. 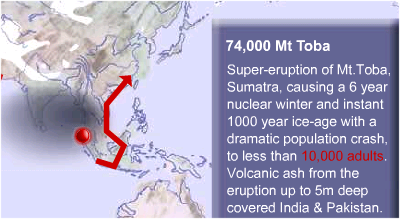 Toba in Sumatra, 74,000 years back, deforested Central India. Temperature dropped by 16 degrees; there was an Ice Age; there was population reduction among the earliest arrivals in India from Africa. The deforestation in turn caused a behavior change in human beings. But did it exterminate Indians or the entire humanity? According to a paper published two years back, we know that few people of Jwalapuram in Andhra Pradesh survived. Stone blades and other tools as well red ochre used in cave paintings were found both above and below the ash layer indicating that whoever lived at that time survived and there was technological continuity. Following Mt. Toba the Indian subcontinent was repopulated again by new migrants from the North-West as well as from the North East. Kedar, if there are traces of it in tribal records, it would be truly fascinating. But look how far back in time this happened, even before the development of language.